T’N’T Apiaries require: An APIARY FOREPERSON (NOC 8252) for immediate fulltime (40+ hrs/wk) year round employment ($19.00-$25/hr depending on experience. Bonuses possible). B. Strong Apiaries Ltd. require the following: APIARY TECHNICIAN 5 seasonal positions available from April 21 - October 21 (2019). Reporting to work at B. Help Wanted: Ethelbert, (MB) WEST 10 HONEY LTD, PO Box 205, Ethelbert, MB R0L 0T0 has the following positions available: APIARY TECHNICIAN (10) Wage: $13.15- $16.00. CASPIAN APIARIES INC is seeking 15 seasonal full time (40+ hrs/week). Apiary Workers (NOC 8431) $13.83/hr for the 2019 season. 5 Workers for Feb 1 to Aug 31. 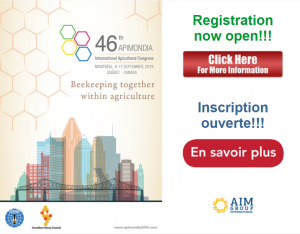 10 Apiary Workers (NOC 8431) with a minimum of 2 years experience working at a Canadian apiary. - Start date March 1st 2019 to October 2019.